The title of this post is a reminder. Mostly to myself. Have a routine. Routines don’t come easy to me. I’m a non-linear thinker and doer. And I’m often distracted by other ideas or videos or fun things. Having a daily routine is critical in game design. The main reason is that game design is a time intensive discipline. Every part of the process takes a lot of time – conceptualization, prototyping, play-testing, designing, illustrating, more play-testing. To keep things on track, you’ll need a schedule. Here’s the schedule I try to keep, which may not work for you. But I’d encourage you to get a routine of some sort going and stick to it as closely as possible. As you develop your own game design projects, or any other for that matter, a routine will help you get where you’re wanting to be. Having a routine keeps procrastination at bay. Procrastination is the enemy. In my office I have an “On Tap” wall. (I like beer references I guess.) It’s basically a wall with a giant sticky note which has super sticky post-it notes placed on it. Each note is a task. I line that task up with which day it needs to happen. Yes, this can be done on my phone or in some other calendar. But this method means the schedule is always within sight. Even when I’ve put my phone down for a while. There’s something about writing each task out, placing it on the day it will happen, and then being able to see everything at a high level that’s really effective for me. I can’t wait to complete tasks so that I can experience removing those notes from the wall. It may sound strange, but rituals like this are methods that work for me. Writing tasks out. Giving them a sense of place or staging them. And then executing with focus on those tasks. Rinse and repeat on a weekly basis. I set my alarm for 5:00am. I’m up by 5:30. Right away I try to drink a glass of water and stretch and do some push ups. Hey, don’t laugh. I can do a few pushups! During weekdays between 6:00am and 9:00 I’m sprinting on dayjob work. I tackle emails from my inbox then I move on to other tasks. Starting the day early means I’m able to get things done with minimal interruptions. I abhor “multi-tasking” so I really strive to stay focused. But hey, it’s a multi-tasker’s world, so I do my best. Around 9:00am it’s time for breakfast. These days I’m keeping it light. After this I’m back at it. It’s meetings, and tasks and phone calls until 11:00am or 12:00pm. I stay available for work through lunch. However, I try to focus for a bit on the rest of my day and how things are shaping up. Sometimes (a lot of times) the day doesn’t go as planned. Despite this, I’m still trying to land in a place where I can mark off the things on my “On Tap” chart. By 4:00pm I’m wrapping up a 10 hour day on the job. If I’m working late, I’m thinking: How can I get done what I need to get done at a high level, but quickly? By 5:00pm I try to be done with day job tasks and take a walk/stretch some more. By 7:00pm my wife and I have already eaten dinner and are on to personal things. Sure I like a nice speak easy or tiki bar now and then, but most of the time we’re hanging out at home watching a show or maybe running errands. On days when we’re doing our own thing, I’m spending my evenings writing, drawing, or designing for personal projects. 10:00pm is when I try to be in bed. Sometimes my brain won’t shut off and other times I’m wiped and asleep by 9:00. In recent years I’ve found I’m more of a morning person. That’s when my brain is most active and wanting to be in creative gear. One thing about getting older is you learn not to view solitary time as expendable. Time becomes more valuable. Growing up, being creative was entertainment for me, so it’s no different now. If you’re a parent, this is one way to ensure your children value their own creativity later in life. While they’re little, help them balance all that screen time with opportunities to express their own inborn artistry. If you do this, they’ll thank you later. The point of all this is I try to have some kind of daily routine. This allows me to control more of how my time is used rather than just reacting to things all day. Surprises and urgent matters come up, but when they do I’m able to shift to them knowing I’ve been being proactive on other tasks. So how do you organize yourself? What tricks and tips would you offer for staying on track and focused throughout the day? We're experiencing stories differently now. In fact, many of us want to participate in stories. This is happening across many forms of media – mobile games, console games, VR experiences, RPGs, tabletop games, podcasts, and yes, sometimes still books too! If you're like me, you enjoy elements of story in the tabletop games you play. You like being immersed in a setting and escaping the mundanity of reality for a while. Sure, not every game needs to be story-driven to be enjoyable. But I think my favorite games have a backstory to them, even if its not too deep or critical to understand when playing the game. Games like Charterstone, Scythe, and Root are examples of games with varying degrees of rich story elements. In Charterstone, you're actually telling the story of your experience as you play. In Scythe, knowing the story helps but it's not critical to understanding the gameplay. And in Root, the backstory is there to help contrast the game's whimsical art with undertones of factional conflict. Some classic games that have more surface level story elements are Clue, Scotland Yard, and Risk. Most of us know the plot of Clue, find the murderer. In Scotland Yard, the city of London is the backdrop for a cat and mouse game between Mr X and the police. And in Risk, depending on the version, the story is about world conflict in an alternate Earth setting. So, here are some things I try to consider in all the games I create – no matter if the goal is deep story OR surface level. Character – This could be a person or a creature. Characterization can be something more abstract too, like a tree, a building, or a machine. Plot – Defeating a monster. Conquering a mountain climb. Finding a missing person. Thinking about who the characters are and what their motivations are, reveals plotlines to explore. Setting – Where does the story take place? This is always a subject I get distracted on. So many possibilities! Conflict – What are the challenges and problems your characters are faced with? Resolution – How will your characters resolve those conflicts? In the end, designing tabletop games means writing. The writing you do will inform your creative process and ultimately lead to more immersion for players. What do you think? Do you prefer tabletop games with rich story elements or more surface level ones? In the summer of 2016, I started using Kickstarter as a way to learn about independently produced projects that I might want to support. I'd heard about Kickstarter for a while but I guess I was just a bit late to the game! 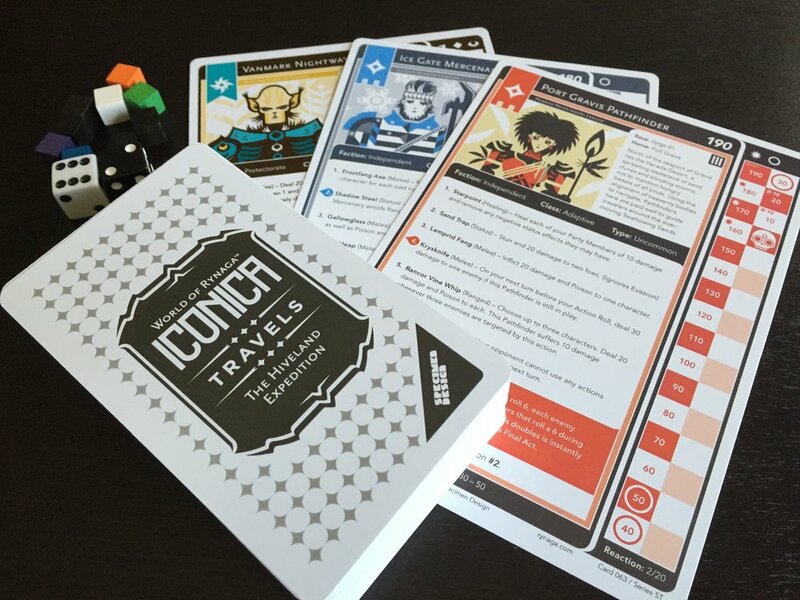 So I'm starting a series of Kickstarter Backer Journal posts that highlight projects I've backed, why I backed them, and what I learned from them. The first project I supported was Nathan Smith's Orbital Primeval playing cards. The project was a standard deck of cards with standard suits illustrated by hand and with an added game variant. Nathan's been a artist/designer friend of mine for years, so when I learned about his Kickstarter project I knew I'd support it. Each card in the deck is illustrated with a character from the Orbital Primeval universe, a dimension of impossible characters with quirky abilities, personalities, and backstories. Players can use the cards to play standard card games (Spades, rummy, etc.) or use the iconography on each card to play a game Nathan designed called Cabal. To me, Cabal resembles a trick-taking game, with high cards contributing to winning hands and points at endgame. I appreciate how all of Nathan's work has a hand drawn aesthetic. It contributes to a garage-made feel, which if you know Nathan, compliments his DIY-tuned values as an artist. His creations are always imaginative and exude an authenticity I really respect. You can see / keep up with Nathan's work here. So how about you? What was the first Kickstarter project you backed? Did you learn anything from the experience? Design is about doing things with planning, purpose, and intent. It involves building meaning into what we create. It also involves fun things like psychology, aesthetic appeal, and in general doing good for your audience. Game design – tabletop or digital – is like any other design practice. It involves using rules, principles, and objectives to achieve a desired outcome. For instance, when creating environmental signage, the goal is to provide clear way-finding directions for the public. With tabletop games our goal is making a fun and satisfying experience for our intended audience. Here are some ways to look at the different aspects of game design. In design, planning is about building a framework or structure for how we'll build a project. When I'm starting a game design project, there are three things I want to understand. How much will this project cost in terms of resources – time, money, energy? How will this project impact current commitments? This project is about creating a game mechanic for a card drafting game. It'll take 10 to 12 months to finish. It'll involve writing down all my ideas, refining prototypes based on those ideas, and developing a solid prototype to play test with many different groups. In my view, planning isn't about solving creative problems or trying to account for every possible variable in my life. It's about getting clear about what we're talking about and what is actually being committed to. After this is done, then we can start setting deadlines. Purpose in design is about asking "why". A lot. For example: Why are we doing this, this way? Why are we building something small instead of something big? Why have we chosen to keep production costs low versus high? So purpose involves understanding the reasons for which something is created. We can't really benefit from how something looks, or how it works, or how much it costs until we ask why. I learned this lesson creating Iconica. The game started with six characters and grew to 106 over 10 years. I kept having ideas for characters and wanted to see them brought to life. I mean, people want more of them, they help expand the world setting, I enjoy making them. Why would I not make more? However, the other question I would have benefited from considering is: Why not streamline the character count? Rather than going broad, go deeper into each character, perhaps with modifications, customizations, or variants of archetypes. This held potential to make each existing character more rich and alive. Things to think about as I consider new projects. For me, this is about keeping my end goal front and center at all times throughout a project. It's easier said than done. As projects go on, the chances for distraction rise. Writing things down and putting them up on the wall. Putting calendar reminders in my phone. Telling someone I respect what I intend to do and asking them to hold me to it. Little rewards for myself when I achieve milestones. Maintaining a practical mindset with regard to design means I'm less inclined to be distracted with all the ways something may look and feel OR what color something is. Those things are just icing on the cake. Substance is built with planning, purpose, and intent. Refining the way we design can only improve our results. What about you? Do you have thoughts on what design is or what it means to you?